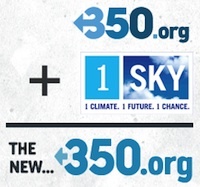 1Sky's goal is to build a diverse, society-wide mobilization that will convince our federal government to take bold action for a clean energy future. To identify the steps that our leaders need to take in order to shift our nation away from climate change and toward the prosperity of a green economy, we've engaged a network of leading scientists and economists to create the 1Sky Solutions. Click on any of the solutions below to learn more. and pathways out of poverty focused on climate solutions and energy efficiency. We can create five million new jobs that will help conserve energy, jumpstart the deployment of new technologies, and contribute to the positive spirit of our ever-expanding movement. The green workforce will help lower barriers to entry for investors, and help revitalize communities that need it the most, resulting in a holistic and equitable transition away from the fossil fuel economy. at least 25% below 1990 levels by 2020 and at least 80% below 1990 levels by 2050. The scientific bottom line is that we need to cut carbon at least 25% by 2020 and at least 80% below 1990 levels by 2050. It's what is necessary, and what is right. and end our dependence on oil through strong standards and incentives for energy efficiency and renewable energy. The damage to our society from the use of coal spans broken mining communities, severe environmental and climate damage, and widespread community health impacts. While the construction of new plants has declined significantly in the last couple decades, the currently existing power facilities and their associated industries continue to decimate our countryside and harm our communities.